The Stratford upon Avon Astronomical Society's September lecture was given by Dr. Robert Massey. He came from London, to give us an excellent talk entitled "Imaging the Universe: The New Generation of Telescopes". Dr Massey did a PhD at Manchester University before working as a further education lecturer in Brighton. He now works at the Royal Observatory in Greenwich, specialising in Education and Public Outreach, a job that ranges from giving television interviews to making models of comets for primary schoolchildren. Telescope technology has moved on greatly in the past few years. Before the 1990's we had no significant optical telescopes in space and no 8 metre class telescopes. The 5-metre Hale telescope on top of Mt. Palomar, Pasadena, California had remained the largest in the world since 1948. Now, the Hubble Space Telescope with its 2.4 metre mirror has been in space for 13 years. The Very Large Telescope in Chile, which has four 8-metre mirrors, uses adaptive optics to produce excellent images. The four telescopes will eventually simulate a 100 metre aperture telescope when they work together, but at present the timing required to link them together is not accurate enough. On Hawaii, there are the Gemini North, Subaru and Keck telescopes, which are all greater than 8 metres, plus many others. 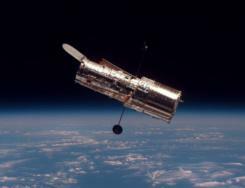 The most famous telescope is the Hubble Space Telescope (HST). It was Lyman Spitzer who proposed a space observatory in 1946, but it wasn't until 1977 that NASA gave the funding. It was named the Hubble Space Telescope after astronomer Edwin Hubble. The HST has a mirror with an aperture of 2.4 metres, with the surface correct to around 1/50th of the wavelength of light. Its resolution is 0.05 arc-seconds, about 10 times better than on Earth. It can reach a magnitude of 31 (a 20cm amateur telescope is capable of about magnitude 14) and operates from ultraviolet to near infrared wavelengths. The HST was ultimately launched in April 1990 after being delayed following the Challenger accident. After its launch, it was discovered that the mirror had a spherical aberration that meant the images were fuzzy. The outer edge of the mirror was ground too flat by a depth of 4 microns (roughly equal to one fiftieth the thickness of a human hair). The flaw resulted in images that were fuzzy because some of the light from the objects being studied was being scattered. This was corrected by the first servicing mission in 1993, when the mirror was given some 'glasses'. This mission was successful, and since then, the telescope has made an enormous contribution to astronomy. It has discovered forming planetary systems, been used to measure the masses of black holes, resolved features on Pluto's surface and confirmed the extra-galactic nature of Gamma Ray Bursts. It is due for another service in 2005, so that it will continue to be a useful tool for astronomers. It orbits Earth at a speed of five miles per second. Images and data collected by the telescope travel 90,000 miles over satellite and ground links before they reach the Space Telescope Science Institute in Baltimore, Maryland. Dr Massey concluded his talk with a description of future projects. This included animations of the Owl (Overwhelmingly Large) telescope, an instrument that will have a 100 metre primary mirror and a secondary mirror 200 metres above ground level.